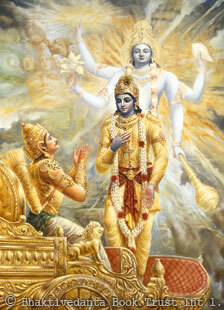 Krishna is the Supreme Person, the Godhead. Krishna is the speaker of the Bhagavad-gita, recognized throughout the world as one of mankind's greatest books of wisdom. In the Gita, as it is also known, Krishna says repeatedly that He is God Himself, the source of everything. Arjuna, to whom Krishna is speaking, accepts Krishna's words as true, adding that the greatest spiritual authorities of that time also confirm that Krishna is God. Traditions that follow in the line of these authorities have carried Krishna's teachings down to the present day.